How do I get to Boulder Hot Springs? Boulder Hot Springs is located in southwestern Montana, halfway between Helena and Butte. By Air: Several carriers offer service to Helena (35 minutes), Butte (45 minutes), and Bozman (90 minutes). Need a ride to Boulder? Contact Kate for help with this. By Car: Heading west on I-90, take the Boulder/Cardwell exit and follow Montana Highway 69 north 30 miles toward Boulder. From I-15, take the Boulder exit and follow Highway 69 through town. Boulder Hot Springs is 3 miles south of Boulder on Highway 69. There are two types of accommodations at BHS: Guest rooms and B&B rooms. Each room accommodates one to four guests. All rooms have sinks, many with private baths. There is a common bathroom with a shower on each floor. The more elegant themed B&B rooms are available for an additional charge and guarantee a full or half-bath. B&B Rooms are $80 per night for one person and $100 for two. The guest rooms are $60 per night for one person and $80 for two. All of these prices would have a 7% tax on them. These are our special group room rates which do not include any of the food. BHS is a quiet, relaxing environment offering a restful haven to all that come here. Therefore, TVs and phones are not provided in the rooms. Alcohol is also prohibited on BHS grounds. How about meals at Boulder Hot Springs? The hotel offers healthy, delicious meals including a lot of organic and locally-grown food for groups staying onsite. Meal cost is $50 per day (three meals). Meals for the weekend retreat begin Friday evening to Sunday lunch, costing $100. Coming early or staying late? Let Kate know in advance. There is a frozen yogurt machine and a variety of drinks and snacks available at the front desk. Complimentary coffee and tea are available in the meeting room. I have special dietary needs–can they be accommodated? Gluten-free and dairy-free meals are available by request for guests with food allergies. Vegetarian options are also available. If you have questions, don’t hesitate to ask. Check-in is between noon and 9pm. If arriving later, arrangements must be made with manager. Check-out is by 11am on day of departure. Payment for room and board is due upon arrival. Participants must provide BHS seven-day notice of cancellation. Yes, WiFi is available at the Inn. Can I be reached by phone while staying at the Inn? Yes, messages can be left at (406)225-4339. When massage staff is available, BHS offers professional massage to guests for an additional fee. Please set-up massage needs with the front desk prior to your visit. Tell me about the hot springs! One of the highlights of a stay at Boulder Hot Springs is soaking or swimming in our spring-fed pools. Our outdoor swimming pool is kept seasonal temperature–warmer in the winter and cooler in the summer. Three tiled indoor plunges, with changing and shower areas, offer men and women separate facilities for soaking in Peace Valley’s healing geothermal waters. Back in 1910, Helena chemist Emil Starz found the water from Boulder Hot Springs to contain some of the earth’s most beneficial medicinal salts, thought to be effective in treating many physical conditions. Water flows from the ground at temperatures between 150 and 175 degrees F and is kept at approximately 104 to 106 degrees in the baths. If you have any health issues, please consult your physician before entering the water. BHS uses no chemicals in the indoor plunges, which are drained, cleaned, and refilled regularly. The water in the outdoor pool is treated with bromine. BHS has been dubbed the “grandmother of all Montana hot springs” because the springs are hotter and stronger than any other in the state. More information is available here. What should I bring to the plunges? Swim suits for the outdoor pool and the men’s indoor plunge. Clothing is optional in the women’s plunge. What can I do in and around Boulder? Nature: You’ll find plenty of hiking, fishing, and wildlife–bear, moose, deer, foxes, antelope, coyotes, birds, and more. For quieter moments, the view from the veranda is breathtaking. The sunrises and sunsets are gorgeous. Tourist Spots: Elkhorn Ghost Town is a popular day trip, as are the local Radon Mines, renowned for their theraputic qualities. Close by are the Lewis and Clark Caverns, Gates of the Mountains boat tour and wilderness, and tours of the state capitol in Helena. Restaurants: Boulder has a few restaurants, and Helena and Butte are only 30 to 45 minutes away, each with numerous restaurants. Outdoor shoes are not typically worn in the hotel. Bring a pair of light shoes or slippers for indoor wear. Alcoholic beverages and illegal drugs are prohibited on BHS grounds. Also prohibited: matches, candles, incense, or fire of any kind; cooking; smoking; and pets. 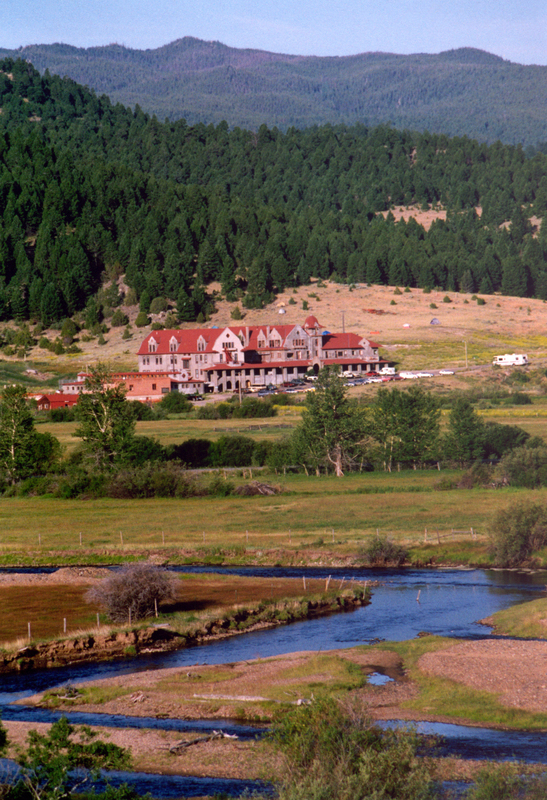 "Nestled in the heart of Montana's Peace Valley, Boulder Hot Springs rests at an altitude of 5,068 feet on 274 acres of fertile land at the edge of Deerlodge National Forest. Centuries ago, Native Americans selected Peace Valley as a sanctuary, which they agreed would always remain free from fighting. And it always has." Cancellation policy: Payment in full is due at time of registration. A 50% refund is available if you cancel on or before July 1, 2018. A 25% refund is available if you cancel on or before August 1, 2018. By registering and submitting payment, you acknowledge that you understand the cancellation policy. Contact us if you have any questions.